Israeli forces continued with systematic crimes in the occupied Palestinian territory (oPt) for the week of 18-24 May, 2017. Soldiers killed a Palestinian child while a girl succumbed to her wounds in Bethlehem. A Palestinian civilian was killed and a photojournalist was wounded by a settler in Howarah village, south of Nablus, and 46 Palestinian civilians, including 12 children and 2 women, were wounded in the West Bank and Gaza Strip. During the reporting period, Israeli forces killed a Palestinian child at the Container checkpoint, northeast of Bethlehem, while a girl from Beit Fajjar, south of the city, succumbed to her wounds. Moreover, a civilian was killed and a photojournalist was wounded by a settler during a peaceful protest in Howarah village, south of Nablus. They also wounded 46 Palestinian civilians, including 12 children and 3 women. Thirty-three of them, including 10 children, were wounded in the West Bank while 13 others, including 2 children, were wounded in the Gaza Strip. In the Gaza Strip, the Israeli naval forces continued to chase and open fire at the Palestinian fishermen in the sea. Israeli forces also continued to open fire at farmers in the border areas. In the West Bank, in excessive use of force, on 18 May 2017, a settler killed a Palestinian civilian and wounded a photojournalist. The aforementioned civilian was wounded when the settler opened fire at Palestinian protesters crossing Nabus-Ramallah Street in Howarah village, south of Nablus. In another crimes of excessive use of force, on 22 May 2016, Israeli forces stationed at the Container checkpoint on al-Nar road, northeast of Bethlehem, killed a Palestinian child and claimed that he attempted to carry out a stab attack. It should be noted that the West Bank cities witnessed on the abovementioned day a strike in all aspects of life, therefore, there was no eyewitness to approve or disprove the Israeli claim. On 20 May 2017, Fatima Taqatqa (16), from Beit Fajjar village, south of Bethlehem, succumbed to her wounds according to Palestinian medical sources. The girl was wounded on 15 March 2017 with a bullet to the head when Israeli forces opened fire at her at “Gosh Etzion” settlement intersection, south of the city. Protests in solidarity with the prisoners: 40 civilians were wounded, including 10 children. Twenty two of them were wounded with live bullets, 18 others were wounded with metal bullets. Twenty seven of them, including 8 children, were wounded in the West Bank while 13 others, including 2 children, were wounded in the Gaza Strip. Weekly protests against the annexation wall and settlement activities: 5 civilians, including 2 children, were wounded with metal bullets. At military checkpoints: a young woman was wounded and then arrested. Israeli forces directly targeted ambulances and press crews. As a result, a Palestinian Medical Relief ambulance sustained damage at the western entrance to Beit Foreek village, east of Nablus. In the Gaza Strip, concerning Israeli attacks on fishermen in the Gaza Strip Sea, on 21 May 2017, Israeli gunboats stationed off al-Shati’ refugee camp, west of Gaza City, opened fire at the Palestinian fishermen sailing within 4 nautical miles. No casualties were reported. On 22 May 2017, Israeli gunboats stationed off Rafah shore, south of the Gaza Strip, heavily opened fire at fishing boats (twice) and chased them. no casualties were reported as well. Concerning attacks on the border area, on 24 May 2017, Israeli forces stationed in watchtowers, east of al-Zaitoun area, southeast of Gaza City, opened fire sporadically at the lands adjacent to the border area. neither casualties nor material damage were reported. During the reporting period, Israeli forces conducted at least 48 military incursions into Palestinian communities in the West Bank, and 11 others into Jerusalem and its suburbs During these incursions, Israeli forces arrested at least 75 Palestinian civilians, including 23 children. Forty-one of them, including 18 children, were arrested in occupied Jerusalem and its suburbs, while 19 civilians, including 9 children, were arrested while participating in protests supporting the Palestinian prisoners. The number of arrested persons this week raises to 94, including 32 children. On 19 May 2017, 2 settlers set fire to a bulldozer at the main entrance to Burin village, south of Nablus. They wrote slogans on the walls in Hebrew signed with “Price Tag”. On 21 May 2017, a group of settlers attacked the eastern part of Burin village, south of Nablus. They attempted to stop the power supply to that area and to attack a number of houses. On 22 May 2017, a number of settlers gathered in the center of Howara village, south of Nablus. They rioted in the streets until late night. Regarding settler attacks against Palestinian civilians and their property in Jerusalem, on 24 May 2017, hundreds of settlers unprecedentedly stormed al-Aqsa Mosque yards in the Old City upon calls to celebrate 50 years of Israeli occupation of the city. During the raid, Israeli forces harshly beat the Islamic Endowments (Awqaf) officers and arrested 3 guards after beating them as well. In a new crime committed by Israeli settlers against Palestinian civilians, on Thursday morning, 18 May 2017, an Israeli settler killed a Palestinian civilian and wounded a photojournalist. According to PCHR’s investigations and eyewitnesses’ testimonies, at approximately 11:30 today, dozens of Palestinian civilians made their way from the center of Nablus via buses towards Howarah village, south of the city. The buses stopped in front of the Education Directorate building, south of Nablus, on the main Ramallah-Nablus Street. After civilians stepped out of the buses, some of them started closing the street from both sides in light of steps in solidarity with Palestinian prisoners’ legitimate demands in the Israeli jails on their 32nd day of an open hunger strike. At approximately 12:10, a white car with an Israeli registration plate and travelled by a settler wearing a Kibbah on his head was heading from Za’atarah Intersection towards Nablus. After passing the cars with high speed, the driver attempted to run over a number of protesters. When a Palestinian ambulance driver saw the settler, he stopped the settlers’ car. The settler then took his gun out and opened fire at the protestors. As a result, Mo’ataz Hussein Helal Bani Shamsah (22), from Bita village, south of Nablus, was hit with a bullet to the head and immediately died. Moreover, Majdi Mohammed Soliman Ishtayah (35), a photojournalist at Associated Press Agency, was hit with a bullet to the right hand. An Israeli military vehicle then arrived at the scene, and the soldiers heavily fired tear gas canisters at the Palestinian protestors to disperse them and evacuate the settler from the area. Following the Friday prayer on 19 May 2017, Palestinian civilians and International activists organized a demonstration in the center of Kufur Qaddoum village, northeast of Qalqiliyah. They made their way towards the eastern entrance to the village in protest against closing that entrance since al-Aqsa Intifada with an iron gate. When the protestors arrived at the abovementioned entrance, the Israeli forces heavily fired metal bullets, sound bombs and tear gas canisters at them. As a result, 5 civilians, including 2 children, one of them was identified as ‘Awad Mansour ‘Obaid (9), sustained metal bullet wounds to the lower limbs of their bodies. Following the Friday prayer, dozens of Palestinian civilians and Israeli and international human rights defenders organized demonstrations in Bil’in and N’ilin villages, west of Ramallah, an al-Nabi Saleh, northwest of the city, protesting against the annexation wall and settlement activities and in solidarity with Palestinian prisoners on hunger strike. Israeli forces forcibly dispersed the protesters, firing live and metal bullets, tear gas canisters and sound bombs. They also chased the protesters into olive fields and between houses. As a result, many protesters suffered tear gas inhalation while others sustained bruises as Israeli soldiers beat them up. 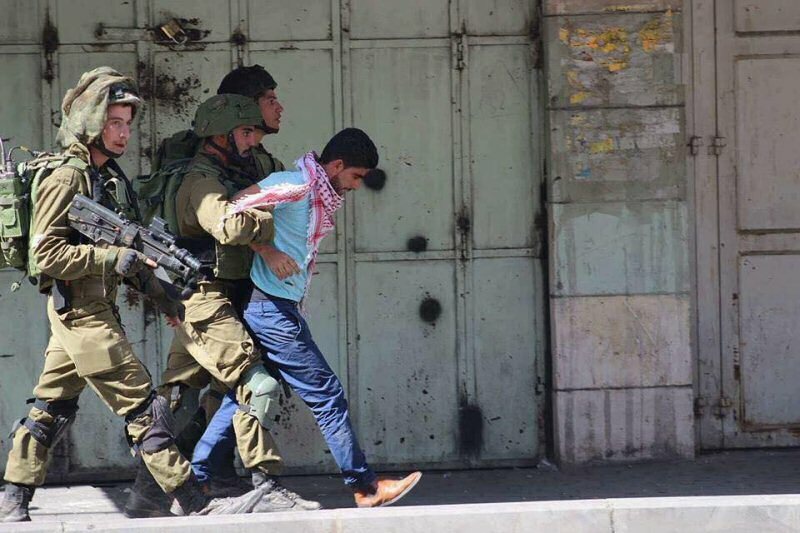 In the meantime, Israeli forces arrested Mustafa Jamal al-Khawaja (15) from Ni’lin village. At approximately 11:30 on Thursday, 18 May 2017, a number of Palestinian young men gathered near the entrance to “Psagot” settlement established on the northern outskirts in al-Birah. The protestors threw stones and empty bottles at the fence of the abovementioned settlement. The Israeli soldiers fired sound bombs, tear gas canisters, and rubber-coated metal bullets at them and chased them. The Israeli forces then arrested Mohammed Samir ‘Azaizah (15). At approximately 17:30 on the same Thursday, Palestinian civilians organized a protest in the center of Qalqiliyah and headed towards the eastern entrance to the city known as “DCO”. They chanted slogans supporting the prisoners in the Israeli jails. The Israeli forces then fired metal bullets at them. As a result, Zahrah Wahib Khadraj (35) sustained a metal bullet wound to the lower back and was taken to Dr. Darwish Nazal Hospital to receive medical treatment. Following the Friday prayer on 19 May 2017, hundreds of Palestinian civilians performed the prayer at the intersection of Bita village, south of Nablus upon a call from the National Committee to Support the Prisoners to perform the Friday prayer in the confrontation areas with the Israeli forces to support the prisoners’ legitimate demands. At the end of the prayer, the civilians threw stones and empty bottles at the Israeli soldiers, who fired live and metal bullets, sound bombs and tear gas canisters at them. As a result, an 18-year-old civilian sustained a two-two bullet wound to the legs. He was then transferred to Rafidia Governmental Hospital in Nablus. Moreover, the father of the wounded civilian sustained a metal bullet wound to the buttock and was medically treated in Beta Medical Center. It should be noted that both civilians are from Osarin village adjacent to Bita village. Following the Friday prayer, hundreds of Palestinians organized a protest in the vicinity of Beit Furik and Bet Dajan villages, east of Nablus, in solidarity with Prisoners on hunger strike in the Israeli jails. The protestors made their way towards Beit Dajan Gate, which was closed 2 years ago. When they approached the gate, the Israeli soldiers fired tear gas canisters and metal bullets at the protestors and medical and press crews. The soldiers fire a tear gas canister at the back of an ambulance belonging to the Palestinian Medical Relief Society driven by Dr. Ghassan Hamdan. As a result, the tear gas canister broke and penetrated the rear window. The soldiers also directly fired another a tear gas canister at a car belonging to Trans Media Company travelled by Joudah Najeh Joudah Abu Nejmah (32), a broadcast engineer from Hebron, and Amoun al-Sheikh, Reporter of Palestine TV Channel. As a result, both suffered tear gas inhalation. Moreover, Naser Khalil Abu Jaish (47), Member of the Political Bureau of Palestinian People’s Party (PPP) and Coordinator of the Committee of National and Islamic Factions in Nablus, from Beit Dajan, sustained a metal bullet wound to the right leg. Following the Friday prayer, Palestinian civilians organized a demonstration and made their way from a set-in tent in al-Mahd square in the center of Bethlehem towards the northern entrance to the city in solidarity with the Palestinian prisoners on hunger strike the Israeli jails. When the protestors arrived at Bilal Ben Rabah Mosque (Rachel’s Tomb) near the military checkpoint between Jerusalem and Bethlehem, the Israeli soldiers fired tear gas canisters and sound bombs at them. During that, dozens of the Palestinian civilians threw stones and empty bottles at the military watchtower and the soldiers. After short period, a number of Israeli soldiers dressed like civilians attacked the stone-throwers and fired live bullets at them. They also arrested 6 civilian; two of whom were identified as Ahmed ‘Oudah and Osayd Abu al-Halawah. On Friday afternoon, Palestinian civilians organized a protest at the main entrance to Deir Abu Mash’al village, northwest of Ramallah, in solidarity with Palestinian prisoners on hunger strike. The protestors threw stones and empty bottles at the Israeli forces, who fired sound bombs, tear gas canisters, live bullets and rubber-coated metal bullets at them. As a result, a 17-year-old child sustained a live bullet wound to the right thigh. He was taken to Palestine Medical Complex in Ramallah to receive medical treatment and later left the hospital. Around the same time, dozens of Palestinian civilians from Beit Ummer village, north of Hebron, gathered in a set-in tent that was established in the center of the city, in solidarity with Palestinian prisoners on hunger strike. The civilians then made their way towards the eastern entrance to the village where there was an Israeli military watchtower. When the protestors arrived at the abovementioned entrance, a large Israeli force deployed on the main road. The young men threw stones at the soldiers, who fired sound bombs and tear gas canisters at them and chased them. As a result, a number of young men suffer tear gas inhalation. The Israeli forces also arrested Hasan Mohammed Hasan Sabarnah (17), who was in front of his family house,and took him to the abovementioned watchtower. In the same time, a similar demonstration took place in al-Zawiyah Gate area in the center of Hebron. At approximately 14:30 on the same Friday, Palestinian civilians organized a protest in the center of ‘Aboud village, northwest of Ramallah. They made their way towards the main entrance to the village, in solidarity with the Palestinian prisoners on hunger strike. When the protestors approached the abovementioned entrance, the soldiers fired live and metal bullets, sound bombs and tear gas canisters at them. As a result, 4 civilians, including a child, sustained live bullet wounds. They were transferred to Palestine Medical Complex in Ramallah and left after receiving the medical treatment. The Israeli forces also arrested Ibrahim Hasan Balas (23) after attacking him. At approximately 11:00 on Saturday, 20 May 2017, a number of Palestinian young men gathered near ‘Atarah checkpoint, north of Ramallah. They threw stones at the Israeli soldiers and set fire to tires. The Israeli soldiers chased the stone-throwers and fired sound bombs, tear gas canister and live bullets at them. As a result, a 16-year-old civilian from Jafna village, north of the city, sustained a live bullet wound to the right thigh. He was transferred to Palestine Medical Complex in Ramallah to receive medical treatment. At approximately 13:30 on Sunday, 21 May 2017, a number of Palestinian young men gathered at the center of Silwad village, northeast of Ramallah. They made their way to the main entrance to the village, in solidarity with the Palestinian prisoners on hunger strike. When the protestors arrived at the abovementioned entrance, the Israeli soldiers fired sound bombs and tear gas canisters at them. During that, the soldiers attacked Mo’men Haroun Edrees (15) and beat him before arresting him. However, no casualties were reported. Around the same time, dozens of Palestinian young men organized a protest in the center of Jericho, in solidarity with the Palestinian prisoners on hunger strike. They made their way towards the northern entrance to the city. When the protestors approached the abovementioned checkpoint, they threw stones and empty bottles at the Israeli soldiers. The soldiers fired live and metal bullets, rubber-coated metal bullets and sound bombs at them in response. As a result, 8 civilians sustained metal bullet wound to the lower limbs of their bodies and received medical treatment by the PRCS ambulance on the spot. At approximately 13:40, dozens of Palestinian civilians organized a peaceful protest in al-Nabi Saleh village, northwest of Ramallah, with the participation of civilians from the neighboring areas in solidarity with Palestinian prisoners on hunger strike. They made their way towards the main entrance to the village near the military watchtower established on the village lands. The protestors threw stones and empty bottles at the Israeli soldiers, who immediately fired live bullets, rubber-coated metal bullets, sound bombs and tear gas canisters at them. As a result, a 26-year-old civilian from Beit Rima village, sustained a two-two bullet wound to the abdomen, and a 15-year-old child from Kafer Ein village, northwest of the city, sustained a metal bullet wound to the leg. Both were taken to Yasser Arafat Hospital in Salfit to receive medical treatment. At approximately 15:00 on the same Sunday, Israeli soldiers chased a number of children in Wad Qaboun area near al-Rama Suburb neighborhood in the northern area in Hebron, and fired live bullets at them after Israeli military patrols were stoned. After that, the soldiers arrested 2 children and took them to the detention center in “Kiryat Arba” settlement. The children were identified as Hamzah Eyad al-Bou (15) and Ahmed Mohammed al-Bou(15). At approximately 09:30 on Monday, 22 May 2017, a number of children gathered near an Israeli military gate established on the main street in a housing project, east of Jericho. The protestors threw stones and empty bottles at the soldiers, who fired sound bombs and tear gas canisters at them and chased them. They then arrested 5 civilians, including 2 children, namely Hamzah Suleiman Khamis (16), Feras Khalil Maharmah (17), Suleiman Khalil Maharmah (20), Mahmoud Jamal Mohammed Lafi (21), all of them are from ‘Aqabet Jaber refugee camp, south of the city, and Mohammed Khalil Sarai’ah (23) from ‘Enata, northeast of occupied Jerusalem. At approximately 11:00 on the same Monday, dozens of Palestinian civilians gathered at the crossroad of Deir Sharaf village, northwest of Nablus. They set fire to tires in solidarity with the Palestinian prisoners on hunger strike. Several Israeli patrols rushed to the area and then fired tear gas canisters and metal bullets at the protestors. As a result, a 21-year-old civilian sustained a metal bullet wound to the head, and a 28-year-old civilian sustained a metal bullet wound to the right leg. They were transferred to Rafidia Governmental Hospital in Nablus. On Monday afternoon, Palestinians organized a protest that made their way from a set-in tent established near Qalandiya refugee camp, north of occupied Jerusalem towards Qalandiya military checkpoint. When the protestors approached the checkpoint, the Israeli soldiers fired live bullets, rubber-coated metal bullets and tear gas canister at them. The area turned into an arena for confrontation that continued for hours. The soldiers then topped the commercial and residential buildings adjacent to the abovementioned checkpoint overlooking the main street. After that, hundreds of Palestinian young men, who were present in the area, threw stones and empty bottles at the soldiers. The PRCS crews announced that 8 protestors, including 5 children, were wounded. Four civilians sustained live bullet wounds, and the 4 others sustained metal bullet wounds. The PRCS crews also said that one of the injuries was classified between moderate and serious as a young man sustained a live bullet wound to the abdomen. He was transferred to Palestine Medical Complex in Ramallah. At approximately 13:30, a number of civilians gathered in al-Zawiyah Gate area in the center of Hebron. They threw stones and empty bottles at the Israeli soldiers stationed at the entrance to al-Shuhada’ Street at which a checkpoint was established. The soldiers patrolled the area and fired tear gas canisters. Israeli backups arrived from al-Shallalah Street and deployed between the shops. They then arrested Husam Hesham ‘Atawnah (23) and took him to an unknown destiantion. Around the same time, a number of Palestinian civilians organized a protest at the main entrance to Deir Abu Mash’al village, northwest of Ramallah. The protestors threw stones and empty bottles at the Israeli forces, who fired live bullets, rubber-coated metal bullets, sound bombs and tear gas canisters at them. As a result, a 27-year-old civilian sustained a live bullet wound to the left leg. He was transferred to Palestine Medical Complex in Ramallah to receive medical treatment. Amin Mohammed Ibrahim Samour (21) from Bani Suheila. He sustained 2 live bullet wounds to the abdomen and pelvis, noting he suffers from a previous disability in his hands. He was wounded when he was about 40 meters away from the border fence. Mousa Zaye ‘Ouda Samour (24) from the eastern area. He sustained a live bullet wound the entered his left side and left from the abdomen. Mousa said to PCHR’s fieldworker that he was injured when he was in a land to harvest parsley. The land is about 300 meters away from the abovementioned border fence, east of al-Farahin in ‘Abasan al-Kabirah. Mohammed Wajdi al-‘Aklouk (22) was hit with a live bullet to the left thigh. At approximately, 14:30 on the same Friday, Israeli forces stationed in the military watchtowers, east of Jabalia in the northern Gaza Strip, fired live and metal bullets and tear gas canisters at dozens of Palestinian young men, who gathered near the border fence between the Gaza Strip and Israel. The young men threw stones at the Israeli soldiers in solidarity with the Palestinian prisoners on hunger strike in the Israeli jails. As a result, ‘Ahed Maher Abdul Rahman Abu Wadi (21) from al-Joron area in Jabalia, sustained a live bullet wound to the right instep causing He was transferred to the Indonesian Hospital in Jabalia and the medical sources classified his injury as serious. Around the same time, Israeli forces stationed in military watchtowers, east of “Nahal Oz” site, east of Gaza, fired live and metal bullets and tear gas canisters at dozens of Palestinian young men, who were present near the border fence between the Gaza Strip and Israel. The young men threw stones at the Israeli soldiers in solidarity with the Palestinian prisoners on hunger strike in the Israeli jails. The clashes continued until at approximately 19:00. As a result, 5 civilians sustained live bullet wounds and were taken to al-Shifa’ Hospital in Gaza. Their wounds were classified as moderate. At approximately 15:00 on Sunday, 22 May 2017, dozens of Palestinian young men gathered and made their way towards the border fence between the Gaza Strip and Israel, east of al-Buraij, in solidarity with the Palestinian prisoners on hunger strike in the Israeli jails and in protest against the Israeli imposed closure on the Gaza Strip. The protestors threw stones at the Israeli soldiers, who fired live bullets and tear gas canisters at them. As a result, Mohammed Samir Baroud (29) sustained a live bullet wound to the right knee. He was taken via a PRCS ambulance to al-Aqsa Hospital in Deir al-Balah to receive medical treatment. His wounds were classified as moderate. At approximately 17:00 on Monday, 22 May 2017, Israeli forces stationed along the border fence between the Gaza Strip and Israel, east of Kahn Yunis, fired live bullets and tear gas canisters at dozens of Palestinian young men, who gathered near the abovementioned border fence, east of Khuza’a village, in response to calls for protests against the Israeli imposed closure in the Gaza Strip. A number of participants set fire to tires when they were about 300 meters away from the border fence. Some of them headed to the security fence raising the Palestinian flags. When the participants approached the abovementioned border fence, the soldiers fired live bullets around them to disperse them, but no casualties were reported. At approximately 15:00 on Tuesday, 23 May 2017, dozens of Palestinian young men gathered and made their way towards the border fence between the border fence between the Gaza Strip and Israel, east of al-Buraij, in solidarity with the Palestinian prisoners in the Israeli jails and in protest against the Israeli imposed closure at the Gaza Strip. The protestors gathered near the abovementioned border fence and threw stones at the Israeli soldiers, who fired live bullets and tear gas canisters at them. As a result, Khalid Husni al-Ghamri (17) sustained a live bullet wound to the abdomen and right hand. He was transferred via a PRCS ambulance to al-Aqsa Hospital in Deri al-Balah to receive medical treatment. His injury was classified as serious and he underwent a surgery. Khaled is so farin the intensive care unit. At approximately 17:00 on Tuesday, Israeli forces stationed along the border fence between the Gaza Strip and Israel, east of Kahn Yunis, fired live bullets and tear gas canisters at Palestinian young men, who gathered near the abovementioned border fence, east of Khuza’a village, in response to calls for protests against the Israeli closure of Gaza. A number of participants set fire to tires on the street that is about 300 meters away from the border fence and while a number of them raising the Palestinian flags headed towards the security fence. When they approached the abovementioned border fence, the Israeli soldiers fired live bullets in their vicinity to disperse them, but no casualties were reported. On Thursday 18 May 2017, Israeli forces established 2 checkpoints at the entrances to Sa’ir and Halhoul villages. On Friday, 19 May 2017, Israeli forces established 3 checkpoints at the northern entrance to Halhoul village and at the entrances to Samou’a and Beit Kahil villages. On Saturday, 20 May 2017, 3 similar checkpoints were established at the entrance to Ethna village and between Beit ‘Awaa and Taramah villages. On Sunday, 21 May 2017, Israeli forces established 3 checkpoints at the southern entrance to Halhoul village and at the entrances to Beit Ummer and Bani Na’im villages. On Monday, 22 May 2017, 2 similar checkpoints were established at the entrances to Kharsa and Beit ‘Awaa villages. On Tuesday, 23 May 2017, Israeli forces established 3 checkpoints at the entrances to al-‘Aroub, al-Fawar refugee camps and Beit Ummer village. At approximately 09:30 on Thursday, 18 May 2017, Israeli forces established a checkpoint in ‘Atara village’s bridge, north of Ramallah. Around the same time, a similar checkpoint was established at the entrances to ‘Aboud and al-Nabi Saleh villages, northwest of the city. At approximately 21:30 on Saturday, 20 May 2017, Israeli forces established 3 checkpoints in ‘Atara village’s bridge, north of Ramallah; and at the entrances to Um Safa and Deir Abu Mish’al villages, northwest of the city. On Sunday, 21 May 2017, Israeli forces established 5 checkpoints on Beteen village raod, northeast of Ramallah and at the entrances to ‘Ajoul, ‘Arorah, ‘Aboud and al-Nabi Saleh villages, northwest of the city. Jericho: Israeli forces established (2) checkpoints in the city. At approximately 10:40 on Thursday, 18 May 2017, Israeli forces established a checkpoint at the northern entrance to Jericho. At approximately 21:30 on Saturday, a checkpoint was established at the intersection of the Dead Sea, south of Jericho. At approximately 23:45 on Thursday, 18 May 2017, Israeli forces established a checkpoint at the entrance to ‘Azoun, east of Qalqilyia. At approximately 11:30 on Friday, 19 May 2017, Israeli forces established a checkpoint at the eastern entrance to Qalqilyia. At approximately 19:10, a similar checkpoint was established at the entrance to Jayyous village, northeast of the city. At approximately 16:15 on Sunday, 21 May 2017,Israeli forces established a checkpoint at the eastern entrance to Qalqilyia. At approximately 10:00 on Monday, 22 May 2017, a similar checkpoint was established at the western entrance to ‘Azoun village, east of the city. The Israeli forces closed the abovementioned entrance until 16:00 and fired sound bombs and tear gas canisters at the Palestinian civilians and their houses. At approximately 21:30, Israeli forces established a checkpoint at the entrance to Jeet village, northeast of Qalqiliyia. At approximately 08:55 on Thursday, 18 May 2017, Israeli forces established a checkpoint at the entrance to Kaful Hares village, north of Salfit. On Friday, 19 May 2017, Israeli forces established 3 checkpoints at the western entrance to Hares village, north of Salfit (was established twice) and at the entrance to Deirsityia village, northwest of the city. At approximately 14:10 on Sunday, 21 May 2017, Israeli forces established a checkpoint at the western entrance to Kafur al-Deek village, west of Salfit. At approximately 21:00 on Monday, 22 May 2017, a similar checkpoint was established at the western entrance to Dersityia village, northwest of the city. Israeli forces closed the abovementioned entrance at turned the area into a closed military zone because of throwing stones at the Israeli settlers’ vehicles and setting fire to tires. At approximately 22:15, Israeli forces established a checkpoint at the entrance to Qarawa Bani Hassan village, northwest of Salfit. At approximately 17:00 on Friday, 19 May 2017, Israeli forces patrolling on “Alon Moreh” settlement road, east of Nablus, arrested 3 children, from New ‘Askar camp. The arrested children were identified as ‘Omar Nasir Sharqawi (14), Marwan Qar’awi (15) and Hamzah Namrouti (14). At approximately 13:30 on Saturday, 20 May 2017, Israeli forces stationed at Qalandiyia checkpoint, north of occupied East Jerusalem, arrested Malak Mohamed al-Ghaliz (14), from al-Jalazoun refugee camp, north of Ramallah. The Israeli forces claimed that the abovementioned child was carrying a knife while walking in the cars’ route. The Israeli police claimed in a statement, “Investigations showed that Malak had left her house taking a knife with her and intending to carry out a stabbing attack to avenge for the killing of the girl, who carried out an attack in Bab al-‘Amoud 2 weeks ago. The investigations are still ongoing with the insistence to extend the suspect’s detention later through the Military Court in Ofer. At approximately 22:45 on Monday, 22 May 2017, Israeli forces stationed at Za’tara village’s intersection, south of Nablus, arrested Yasir Tawfiq Mahmoud ‘Odah (43), who is a former prisoner, after checking his ID card. They took him to an unknown destination. At approximately 11:00 on Tuesday, 23 May 2017, Israeli forces deployed in the Old City neighbourhoods in the center of Hebron, arrested Raied ‘Adnan Da’nah (17), claiming that he did not obey the Israeli forces’ orders. Raied was then taken to Ja’bara interrogation center, east of Hebron. At approximately 14:00 on Wednesday, 24 May 2017, Israeli forces stationed at Abu al-Reish military checkpoint established at the southern entrance to Hebron’s Old City, arrested Mohamed Dawoud Abu Snayah (24). At approximately 13:00, Israeli forces arrested Mohamed Ahmed al-‘Allami (16) from his house in Abu al-Touq area, east of Beit Ummer village. They arrested Mohamed under the pretext securing the area for a Marathon organized by the Israeli settlers. At approximately 00:00 on Thursday, 18 May 2017, Israeli forces moved into Sho’fat refugee camp, north of occupied East Jerusalem’s Old City. They raided and searched houses from which they arrested 7 children. The arrested children were identified as Nour al-Deen Bilal Taha (16), Bashar Fawaz al-Dibs (17), Mohamed Fahmi al-Bakri (16), Mohamed Rebhi Abu Rajab (16), Suhaib Ayman al-Hindiy (15), Mohamed Hosheeh (15) and Mohamed al-Salimah (16). Around the same time, Israeli forces moved into Silwan village, south of occupied East Jerusalem’s Old City. They raided and searched a house belonging to Badir Salah and arrested his son Mahmoud (14). At approximately 02:00 on Thursday, 18 May 2017, Israeli forces moved into al-‘Issawiyia village. They raided and searched houses from which they arrested Mahmoud Adeeb Abu al-Humus (14) and Fadi Fathi Abu al-Humus (16). Around the same time, Israeli forces moved into Hizmah village, northeast of occupied Jerusalem. They raided and searched houses from which they arrested 6 civilians. The arrested persons were identified as Sho’aib Ahmed ‘Odah ‘Askar, Mohamed Khalil Talib al-‘Omari, Moahmed ‘Abbas Talib Salah al-Deen, Mohamed Sanad Harb Is’aied, Ameer Mohamed Naiel Rasheed and Abed al-Rahman Osama al-Khateeb. At approximately 01:00, Israeli forces moved into al-‘Issawiyia village, northeast of occupied Jerusalem. They raided and searched houses from which they arrested 5 civilians, including 3 children. The arrested persons were identified as Adam Fadi Mostafa (16), Yousef ‘Isaa Mostafa (17), Anas Ali Abu ‘Asab (16), Waseem Naief (19) and Ahmed Kaiyd Mahmoud (19). At approximately 02:00 on Sunday, Israeli forces moved into Abu Dies village, east of occupied Jerusalem. They raided and searched houses from which they arrested Amjad Mohamed Rabee’ (22) and Ali Jamal Rabee’ (21). Around the same time, Israeli forces moved into Sho’fat neighbourhood, north of occupied Jerusalem’s Old City. They raided and searched houses from which they arrested Abed Mohamed Sa’eed Abu Khadir, Ameer Majdi Abu Khadir and Nasir Abu Khadir. At approximately 04:00, Israeli forces moved into Silwan village, south of occupied East Jerusalem’s Old City. They raided and searched a house belonging to Mohamed Ahmed al-‘Abasi (20) and arrested him. At approximately 01:00 on Monday, 22 May 2017, Israeli forces moved into al-Thawri neighbourhood, south of occupied East Jerusalem’s Old City. They raided and searched houses from which they arrested Yousef Abu Nijmah (15) and Fayiz Barqan (17). At approximately 01:00 on Tuesday, 23 May 2017, Israeli forces moved into al-Mukaber Mount area, southeast of occupied Jerusalem. They raided and searched houses from which they arrested Mohamed Salah Abu Daheem (23) and Islam Ayman ‘Owisat (22). At approximately 03:00 on Tuesday, Israeli forces moved into Silwan village, south of occupied Jerusalem’s Old City. They raided and searched houses from which they arrested Mohamed Kaiyd al-Rajbi (14), Samah Sarhan (23) and Mohamed Ziyad Ziydani (20). At approximately 07:00 , Israeli forces arrested Mohamed Abu Nab (15) and Nabil al-Natshah (14) while they were going to their school in Ras al-‘Amoud neighbourhood, east of occupied Jerusalem. On Wednesday, 24 May 2017, hundreds of Israeli settlers raided al-Aqsa Mosque yards in occupied East Jerusalem’s Old City in order to celebrate the 50th anniversary of occupying Jerusalem. Moreover, Israeli forces assaulted and severely hit the staff of the Islamic Endowments Department (Awqaf) and arrested 3 guards after hitting them as well. Firas Abu al-Dibs, Head of the Islamic Endowments Department’s public relations, said that around 708 Israeli settlers raided al-Aqsa Mosque at 07:30 until 11:00 and around 135 Israeli settlers raided the mosque in the afternoon. He also said that these were unprecedented numbers of settler raiding the mosque. Moreover, many Israeli settlers performed their religious rituals at the entrances to al-Aqsa that resulted in clashes with the mosque guards who tried to prevent them from doing so. Al-Dibs added that the Israeli forces assaulted and severely hit the staff of the Islamic Endowments Department and arrested 3 guards after hitting them as well. The guards were identified as Khalil al-Tarhouni, Nidal al-Wa’i and Nour Abu Hadwan. Furthermore, the guard ‘Arafat Najeeb was wounded and then taken to al-Maqasid Hospital to receive medical treatment. In the morning, the Israeli settlers organized demonstrations in occupied Jerusalem’s Old City heading to al-Buraq Wall, in preparation for the “annual flags” demonstration. At approximately 15:30 on the same day, tens of thousands of settlers raided occupied East Jerusalem and organized their “annual flags” demonstration in order to celebrate the 50thanniversary of the occupation of the eastern part of the city according to the Jewish calendar. The “annual flags” demonstration stsrted from West Jerusalem to al-Buraq Wall, passing through the streets of the city under the supervision of the Commander-in-Chief of the Israeli Police, Roni Al-Sheikh. The Israeli authorities repressed a protest organized by the Jerusalemites and another protest for the Israeli peace activists in Bab al-Amoud area. During the “flags” demonstration, the Israeli settlers passed through al-Amoud Gate and Al-Wad Street heading to al-Buraq Wall. Large groups of the Israeli settlers were allowed, for the first time, to walk from al-Amoud Gate towards Bab Al-Sahira, then al-Asbat and the Magharibah Gates to al-Buraq Wall. In the meantime, they danced and sang, especially in al-Amoud Gate yard. Many of them were wearing T-shirts, on which drawn pictures of the alleged Temple Mount, as well as racist slogans against the Palestinians and Arabs. Before the beginning of the demonstration , the Israeli forces closed some streets in Jerusalem and established checkpoints. Dozens of Israeli soldiers, special forces and border guards deployed in the streets, especially al-Amoud Gate area, Nablus street and al-Sahirah Gate. As a result, the movement of the Jerusalemites was obstructed. During the settlers raid into occupied East Jerusalem, a group of Palestinian young men gathered in al-Amoud Gate yard and raised the Palestinian flag. Few minutes later, the Israeli forces assaulted them, took them out of the area and confiscated the Palestinian flags. Moreover, the Israeli peace activists organized a protest in al-Amoud Gate area as a rejection to the”annual flags” demonstration, but the Israeli forces assaulted them and forcibly dispersed them. Moreover, the Israeli forces confiscated the Palestinian flag from members of “Naturi Karta” organization, which is an Anti-Zionism organization, while they were in Nablus Street. They also arrested two Palestinian civilians who were identified as Amjad Shweiki and Areen Za’anin. At approximately 19:00 on Sunday, 21 May 2017, a group of Israeli settlers from “Giv’at Ronin” settlement, east of Bureen village, south of Nablus, moved into the outskirts of the village. They attempted to cut off the power supply in the area and raid some houses. A group of Palestinian young men gathered and threw stones at the Israeli settlers, during which the Israeli forces arrived to protect the settlers and took them to the abovementioned settlement. During the stone-throwing, a vehicle belonging to Zakaria Mohi al-Deen al-Sidah sustained damage. It should be noted that Zakaria works at an Israeli Human Rights organization. Moreover, Muneer Qadous (43) was hit with a stone at his left side. At approximately 10:00 on Monday, 22 May 2017, a group of Israeli settlers gathered in the center of Hawarah village, south of Nablus, where they carried out riot acts. The Israeli settlers remained in the area until the midnight, obstructing the Palestinian civilians’ movement. Fully detailed document and other news available at the official website of the Palestinian Centre for Human Rights (PCHR).